There has been too much work overload in the current days, not letting me blog as often as I want to. Meanwhile, have a look at and share this well done infographic about Lyme disease. Click here for the source, more info and also other infographics. Giardia is a very successful parasite. It’s highly durable cysts enter the body via contaminated food. Once inside the small intestine, the cysts hatch and the trophozoites start swimming with their multiple flagella. They attach to the intestine’s surface and enjoy the nutrient rich environment of the small intestine. Shortly after, they start producing cysts that leave the body via feces. Their presence may or may not cause severe symptoms. In many cases people carrying Giardia in their body – thus shedding cysts – might not feel anything. On the other hand, Giardia infection can lead to severe diarrhea that could stick around for weeks if untreated. Our immune system usually manages to control the infection and get rid of the parasite. But in any case, the parasite can come, live and go undetected. 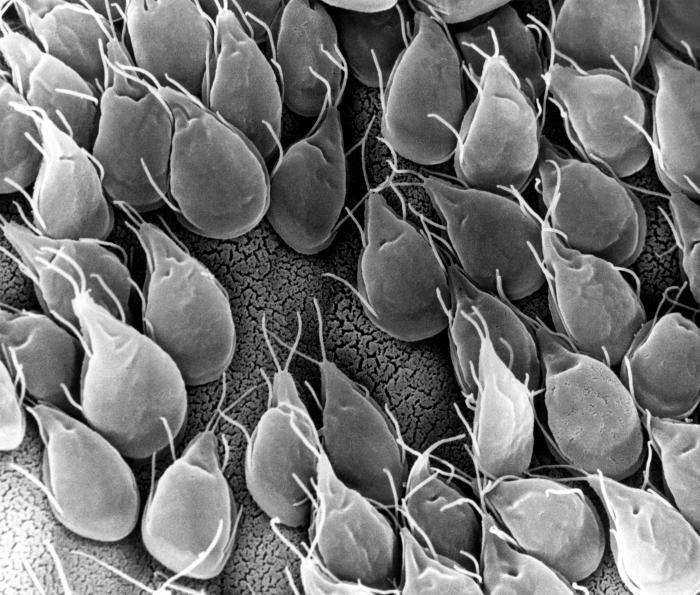 Similar to many other parasitic diseases, since Giardia infection does not kill a significant number of its victims, is not rampant in industrialized countries and is more or less readily treatable, it is not funded and studied by many researchers. Unfortunately, despite unique biological features such as lack of mitochondria, presence of two nuclei and an anti-inflammatory host-pathogen interaction, Giardia remains largely understudied. We don’t fully understand the host and pathogen factors that could lead to disease or just sub-clinical infection. Nor we know much about how Giardia gets detected by the immune system and what is the nature of the immune response that kicks the parasite out of the body. One of the strong incentives for studying Giardia is its higher prevalence in children. Infectious diarrhea is still the most common of cause of child death (Cryptosporidium is another understudied parasite and causative agent of diarrhea in children, which I discussed in another post). A recent study by Bartelt et al. published in Journal of Clinical Investigation, presents a new model of Giardia infection, focusing on malnutrition and young age. They argue that many children in areas where Giardia infection is common are undernourished. This malnutrition could contribute to development of a persistent Giardia infection with severe symptoms rather than a shorter non-symptomatic infection. To study the effect of children malnutrition on Giardia infection, they set their model on 3-week old recently weaned (taken away from mother, eating solid food) mice. They show that although healthy mice are able to clear the infection, Giardia parasites manage to stay longer in the small intestine of malnourished mice and also cause more growth impairment. It can be thought that this is a vicious cycle, where infectious diarrhea causes further weakening of the individual and thus further difficulty in fighting the infection, leading to severe weight loss and persistence of the parasite. Interestingly, the load of parasite in the intestine remains unchanged when comparing healthy and malnurished mice. However, the authors describe their model by pointing to other differences such as immune response and small intestine pathology. More studies on this model can help us better understand and hopefully better treat Giardia infection in children. Diarrhea is the second major killer of children under the age of 5 in developing countries (second to pneumonia). We know much less than we should about the causative agents, severity, burden etc. of diarrhea in developing countries. Funded by Bill and Melinda Gates Foundation, A Global Enteric Multicenter Study (GEMS) picked up the task of learning more about diarrhea in children in developing countries with high incidence (Gambia, Mali, Mozambique, Kenya, India, Bangladesh and Pakistan) and did an extensive 3 year-long case-control study. I won’t go to details about their magnificent work but just mention one rather surprising finding. They found the 4 top pathogens causing diarrhea in children under 5 to be: 1. Rotavirus 2. Cryptosporidium 3. Shigella 4. Enterotoxigenic Escherichia coli producing heat-stable toxin (ST-ETEC). Rotavirus has long been known as a major cause of diarrhea in children and there are effective vaccines against it who have significantly reduced its incidence in developed countries. Shigella and ST-ETEC were also previously known. But the high incidence of Cryptosporidium has come out as a surprise to everyone. Crypto is an apicomplexan protozoan parasite, kin to other famous parasites Plasmodium and Toxoplasma. It’s durable cysts are shed in the stool and can be ingested in contaminated food and water. Compared to the other top pathogens and with regards to the high mortality it is causing, Crypto is relatively unpopular and extremely understudied (even reflected in its Wikipedia page). Now GEMS calls for more research on Crypto and better therapies against it. Hopefully this would mean more funding for studying this bizarre parasite and more exciting knowledge learnt from its biology and pathophysiology. Find and share GEMS infographic about their findings from here.